Ooooo baby baby... That looks so freaking delish! Bubbles and strawberries is my kinda combo. All the best for the new year darl, see you soon! Beautiful cake! It sounds and looks wonderful. What a gorgeous looking cake. 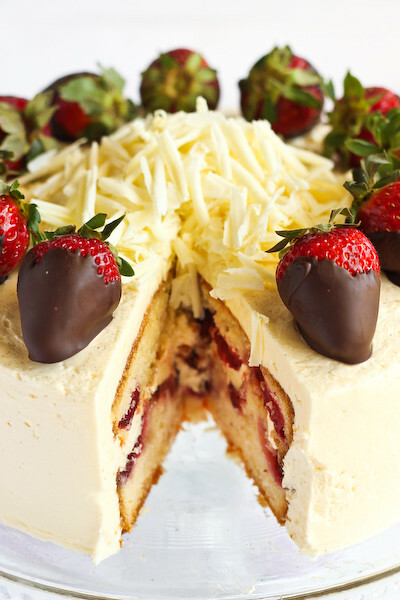 I thought you had layered it with strawberries, but baking them directly onto the cake is genius. And how did you get the edges of your cake so neat? Tres professional! This will be gracing my New Year's Dessert table! teehee lols @ the slice cut out of cake before being given! gorgeous cake dude and happy new year! 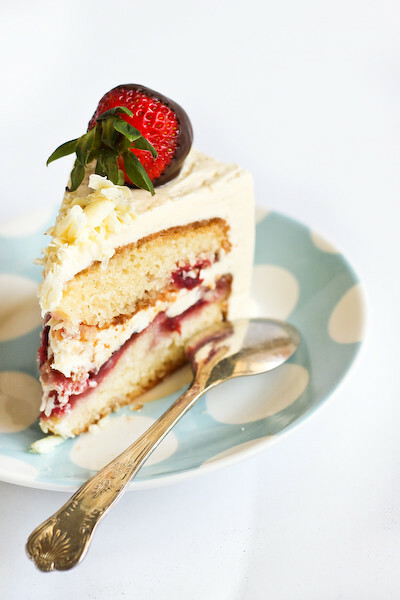 Oh how I enjoed these pictures, the cake and buttercream is just perfect! OMG! That looks absolutely delicious!! 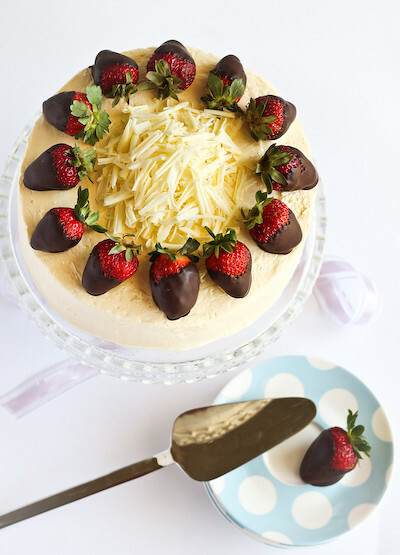 The strawberries just make me want to dive right in and I am so curios about the tast of the pink champagne butter cream! ooh that cake looks awesome! I love all the strawberries studded into the cake itself, so pretty and pink :) happy new year steph! Happy New Year and many more cakes for 2011! what a fantastic idea for a cake! i'm going to do this as soon as i get the chance. happy new year! 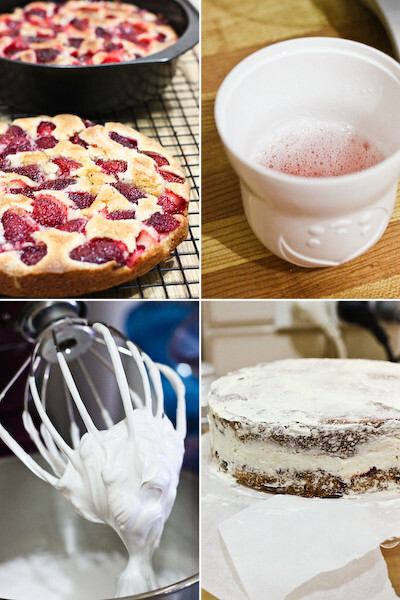 the pink champagne in this recipe got my attention! 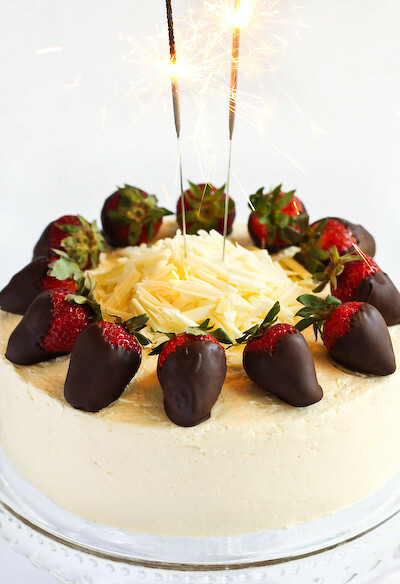 what a great cake to celebrate the new year with. happy new year girl! gorgeous cake!! thanks for sharing, going to try that out. happy new year to you! 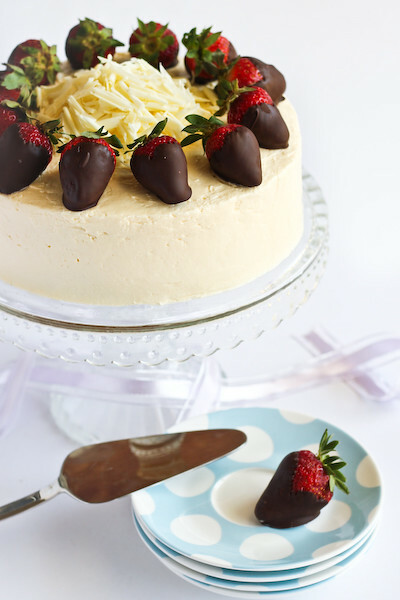 Sensational idea to bake the strawberries into the cake and sprinkling with sugar guarantees sweetness no matter what shape the strawberries are in - personally I don't think the last three years' strawberries have been good at al, whatever happened to the Camerosa variety which was always sweet? Sigh! I am making thins cake for my birthday! It sounds amazing! 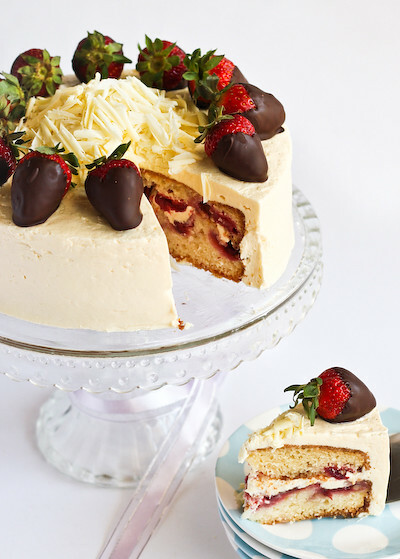 I dribbled over this cake back in December when you first posted and I am (finally!) going to adapt it to make Valentine's Day cupcakes. Thank you so much for the inspiration - and wish me luck! That is a beautiful cake! I can only imagine how wonderful it tastes! Thank you, thank you, thank you for this recipe. I took it to a friends New Years Eve celebration and it was an absolute hit. The only downside was that there was no leftovers for seconds ;) This was also my first introduction to SMBC, what a sensational, sophisticated taste and I will not be going back to the old BC recipe. Question for you- I'm having trouble getting my egg whites any where close to 160 degrees celcius. Any ideas for trouble shooting? Argh! The recipe should read 160 degrees Fahrenheit, which is 70 degrees celcius. So sorry about the ambiguity, I will update that right now! What is 160C equivalent to in Fahrenheit? 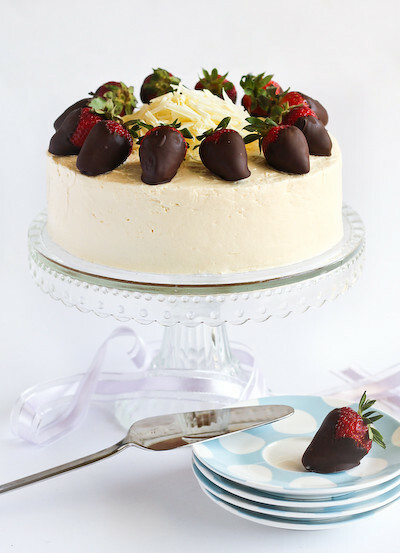 This cake looks beautiful - I was thinking about making some sort of cupcake version for my mum's birthday... do you think by using the same ingredients and replacing with smaller chunks of strawberry throughout the mixture it would work out? I know the pieces might sink to the bottom, but hopefully would still taste good! Hi HC, I think that should work fine! A cupcake version sounds lovely. Good luck with adapting the recipe and happy birthday to your Mum! Hi can I just leave out the champagne for the buttercream. Sure...but you might want to replace it with another flavouring like vanilla or some strawberry puree or jam? Cant wait to try this! Recommendations for pink champagne? Would sparkling rose or pink moscato work? Absolutely! Both would be lovely! 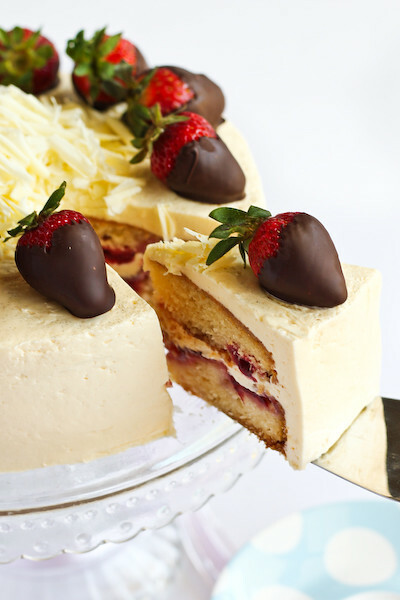 Hi, this recipe is great, I just had one problem with the buttercream, everything was going great until I added the champagne and now it's too runny, any ideas on how I can save it?? Try chilling the mixture in the fridge and then whipping it again, hope that helps!